There are over 5,000 species of slugs around the world, but there are only four that cause lots of damage to gardeners in temperate climates. The common garden slug is the smallest of the slugs that infest home gardens, but it attacks plants both above and below the ground. It is a black creature that grows to a length of about 30 mm (1-1/4 in), with a pale side stripe and orange mucus. It is an especially slow-moving slug, capable of just 1.7 meters (5 feet) per hour. Native to Britain, it is an invasive species in the Maritime Provinces of Canada and British Columbia, in Australia, and in Alaska and the North American Pacific Northwest. This slug is edible, but tastes horrible, accumulates pesticides in its body, and can carry the French heartworm Angiostrongylus vasorum. Dogs can be infected with heartworms if they eat this slug. The heartworm does not infect humans. I think we can safely say that having slugs in your garden is a harmful thing to pets, humans and plants. The second-smallest garden slug is an above-ground feeder with a voracious appetite. Field slugs are particularly fond of leafy vegetation, and are often found nestled inside the leaves of lettuces or cabbages. Native to northern Europe, it has spread to Australia, New Zealand, Central Asia, South America, and the United States. Garden slugs are killed by exposure to temperatures over 30 degrees C (86 degrees F), and they are especially vulnerable to a kind of poison called metaldehyde. This slug often has a parasite (a nematode) that has its own parasite, a bacterium called Moraxella osloensis, which can cause serious infections such as osteomyelitis, endocarditis, and meningitis in humans. Ever wonder what happened to all your tulip bulbs, or what ate your potatoes while they were still in the ground? The culprit may have been a keel slug. The keel slug is a larger slug that curls up into a sickle shape when it is threatened. It feeds almost exclusively beneath the surface of the soil. It can grow up to 60 mm (2-1/2 inches) long and is gray or olive colored. It may have a yellow or orange stripe along its “keel,” the ridge in its back. Growing up to 200 mm (8 inches) long, the black slug is the granddaddy of all garden slugs. Most of the time, it is actually a beneficial presence in the garden, feeding on dead animals, rotting vegetation, fungi, and manure. It only causes damage in the early spring when it is easier to find tender shoots than decaying plant matter. 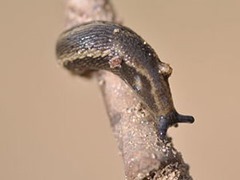 Because the black slug helps increase the fertility of garden soils, there is an old garden saying “Slug of black, put it back, slug of gray, keep at bay.” In the US and in southern Britain, the black slug sometimes appears red (with sun exposure), but these slightly smaller reddish slugs perform the same service in the garden. It is most often found in rotting matter under living plants. The black slug is another slug you should never handle with bare hands. It is a reservoir for the infectious bacteria called Clostridium, and it can carry nematodes that can infect pets and people. Although nematodes are used for slug control. 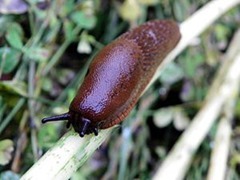 Slugs are mostly likely to transmit diseases to people who have home gardens and live in homes that are not connected to municipal sewer systems. When rats are out control, slugs are more likely to transmit diseases. Baby slugs can hide on garden produce, which has to be washed thoroughly to be safe even if it is grown organically. 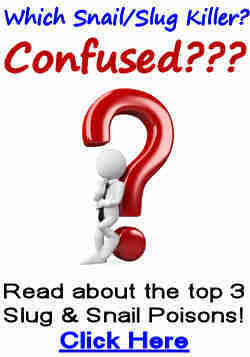 If you want to get rid of the slugs in your garden, read these two articles to learn about the Top 3 Slug Baits and Top 3 Slug Barriers. What Attracts Snails and Slugs to My Garden? Discover what attracts slugs & snails to your garden and learn new ways of deterring them. When Are Slugs and Snails Most Active? Learn about how temperature, humidity and mating affect the activity of slugs & snails in your garden. Most gardeners only need to worry about two types of snails, and you read about them here. There is not a silver bullet that will get rid of all the slugs and snails in your garden but adopting a few simple tactics will ensure they are kept under control, and your prized flowers and/or vegetables will be protected. Discover the top 8 tips & tricks for getting rid of snails & slugs using natural methods.